The different spreads in tarot. Once you have learned the meanings of your Tarot deck, you can parlay that knowledge into learning different spreads in Tarot. One thing about tarot is assured: you'll never get bored with it. Every reading is unique, and the different spreads in tarot always offer a fresh perspective. When you're first learning tarot, there are two basic spreads that are the easiest to use for practice, although you'll still return to them even after you learn other spreads. Celtic Cross: This simple ten card spread is laid out in a cross-like pattern with the last five cards laid vertically to the right of the cross. You'll find the pattern for this spread in our article on Basic Tarot for Beginners. 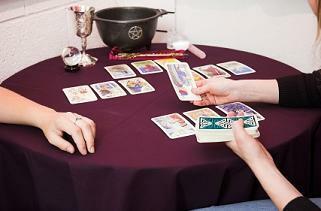 Three Card Spread: This spread is most effective when asking simple yes or no questions. The three cards represent your past present and future and are laid out from left to right. This spread is useful when someone is searching for direction or wondering what they should do about a particular situation. Align each row at the left. The Ellipse spread is best used when the person receiving the reading is searching for answers to specific questions. There are a total of seven cards laid in a wide V pattern. This spread is used when someone is searching for answers about their romantic relationship. The first card is laid at the top, in front of the person receiving the reading. Card two is laid underneath and to the left of card one. Card three is laid to the right of card two. This sets up a triangle, and you'll build two columns in descending order from cards two and three. Beneath card two, you will lay your fourth a sixth cards drawn from the deck. Beneath card three, you will lay your fifth and seventh cards drawn. The eight and final card is laid at the bottom of the columns in a position similar to card one, only this time it's in front of the person giving the reading. This spread is used when the person receiving the reading is looking to growth emotionally and spiritually. Third row from the top: Cards seven, one and three to make a pyramid. It takes time to become adept at learning and interpreting different spreads in tarot, so be patient. Once you've mastered some of the simpler spread listed above, you can move on to more involved tarot layouts.